Yeah right, who doesn’t know this vine fruit? It is so important for it served as a staple food for the locals during the early times of the i-Sagada existence. Almost all houses maintain a parch of land for growing this plant. If you ask an old local of how he/she was able to survive for ages, you’ll get a reply, “that is because of “UBI” or Camote. CSPI ranked the sweet potato #1 in nutrition of all vegetables. 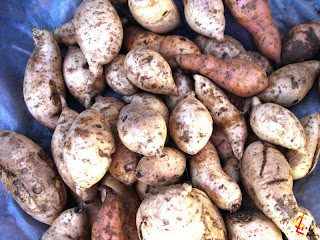 With a score of 184, the sweet potato outscored the next highest vegetable by more than 100 points. Points were given for content of dietary fiber, naturally occurring sugars and complex carbohydrates, protein, vitamins A and C, iron and calcium. Points were deducted for fat content (especially saturated fat), sodium, cholesterol, added refined sugars and caffeine. The higher the score, the more nutritious the food.